President Michael Roth ’78 and Provost and Vice President for Academic Affairs Joyce Jacobsen hosted a University Facilities Planning Update and Overview Forum in which they outlined the University’s plans for future construction and additions on Tuesday, Feb. 6. “What we’re here to talk about today is an important aspect of Beyond 2020, which was a facilities program that would both enhance the educational spaces on campus to provide support for the distinctive educational program offered and to position Wesleyan as a place where pedagogical experimentation and informal student learning will continue to take place for years to come,” Roth said. The forum began with Jacobsen providing a background on the facilities at Wesleyan as well as their budgets. She explained that from 1998 to 2007, under President Bennet’s leadership, the University made weighty investments in facilities such as Clark Hall, Freeman Athletic Center, Usdan University Center, Memorial Chapel, the ’92 Theater, Bennet Hall, Fauver Apartments, and Downey House. Since 2008, however, the University has shifted its focus to growing the endowment while still devoting resources to Boger Hall, the sciences, housing improvements, the Allbritton Center, two cogeneration power plants, Fisk Hall, the R. J. Julia bookstore, the Digital Media Studio, the Shaprio Writing Center, Exley Science Center, Citrin Field, the Cross Street Dance Studio, and Malcolm X House. The University also worked with Sasaki Associates to develop a framework for campus planning. Jacobsen continued the forum by addressing the University’s planning process and desired outcomes in 2018 and beyond. Ideally, the University wants to build new arts facilities, redesign the Public Affairs Center (PAC), and create new additions for the sciences. First, Jacobsen addressed the Film Studies building, which currently spans 28,000 square feet. The University wants to build a 16,000-square-foot addition that would include a production studio, a 50-seat theater classroom, expansion of storage facilities, and additional faculty and student spaces. The University hopes this effort will not only cement Corwin-Fuller Professor of Film Studies and Founder and Curator of the Cinema Archives Jeanine Basinger’s legacy, but also that it will leverage the College of Film and the Moving Image’s success and national recognition as a top-ten national film program. The project is expected to cost $15 million and currently, more than $4 million has already been raised. “The project will provide a state-of-the-art home to a high-demand major and to a flagship program that has recently added a minor and has vastly expanded its ability to support student filmmaking,” Jacobsen said. Following this, Jacobsen discussed the University’s plans to move the Arts Collection into Olin Library. The collection included works by Dürer, Northern and Italian Renaissance artists, Rembrandt and his contemporaries, nineteenth-century French painter-printmakers such as Manet and Millet, and American modern and contemporary artists such as Jim Dine. Classes currently can visit the collection, but no more than twelve students can enter the study space at once time. The collection also lacks climate control. Creating a new study space would allow up to 30 students into the space while providing a much more contiguous art preparation space. Similarly, moving the collection to Olin will also provide secure, climate-controlled vitrines so all students can attain more exposure to these artworks and can curate their own mini-exhibitions. As Jacobsen explained, the renovation will also allow for student training in preparation of art for exhibit. On top of these changes for the arts, Roth and Jacobsen announced that the University would also like to create a larger, air-conditioned South Gallery on the first floor of the Zilkha Gallery while addressing electrical infrastructure upgrades as needed. After addressing the arts, Jacobsen turned toward the Public Affairs Center (PAC), home of the University’s social sciences. Originally built in 1928 and last renovated in 1954, PAC encompasses 77 offices for faculty and staff as well as 13 teaching spaces, covering 48,000 square feet. In a Sasaki survey, PAC was cited as one of the University’s most heavily used buildings and least liked. As Jacobsen explained, the building structure currently requires annual maintenance and houses mechanical systems that are wasting University money. PAC’s transformation will cost about $40 million and will include internal and external changes, such as renovated classrooms, additional lounge areas, connectors to the main part of the building, and as Jacobsen describes, more useful circulation space. Lastly, Jacobsen addressed a redesign of the sciences. Since the early 2000s, the University has gone from 200 science majors per class to about 400 today, especially in Neuroscience, Biology, and Psychology. 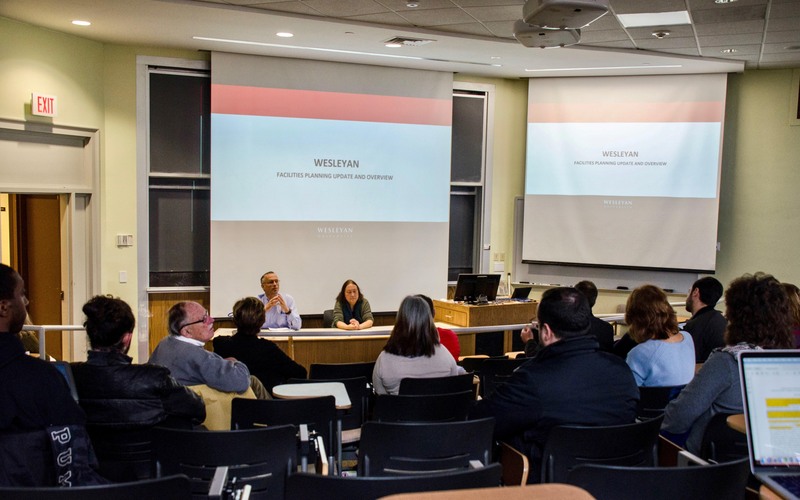 According to Jacobsen, the Hall-Atwater building—built in 1965—cannot support the expansion required in the sciences, as Wesleyan is a leader in the sciences amongst its liberal arts peers. Roth and Jacobsen then opened the floor to Q&A, during which faculty and students asked about print collections, the Alsop House, and the connection of the University with Middletown.